After our rest stop in Page and Kanab, it was time to hit our next National Park. We packed up our stuff, deflated the Sleep Number bed, and took an uphill journey to Bryce Canyon, elevation 8000 feet. Small tip: make sure all your top-down bottles are placed upright or you will have some explosions when you open them at high altitude (ask me how I know). We stayed at Ruby’s Inn RV Campground right outside of Bryce Canyon, making for a convenient drive (or shuttle ride) into the National Park. The campground is quite large with a lot of sites. We were in the newest part of the park with HUGE sites and no trees, which was fine with us. 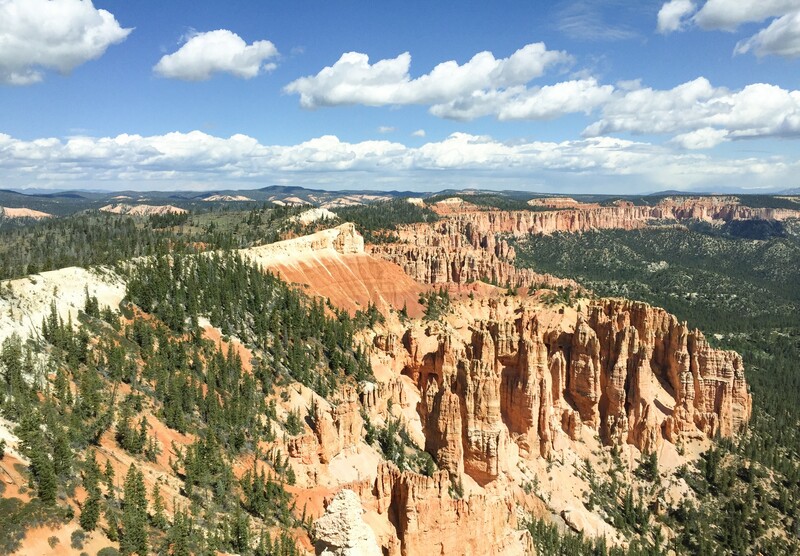 At the higher altitude, Bryce was a chilly change from Page and Kanab, especially since that week was 10 degrees colder than average. Our low/high temperatures ranged from 27-65 that week, so full sun on Rover was a relief. 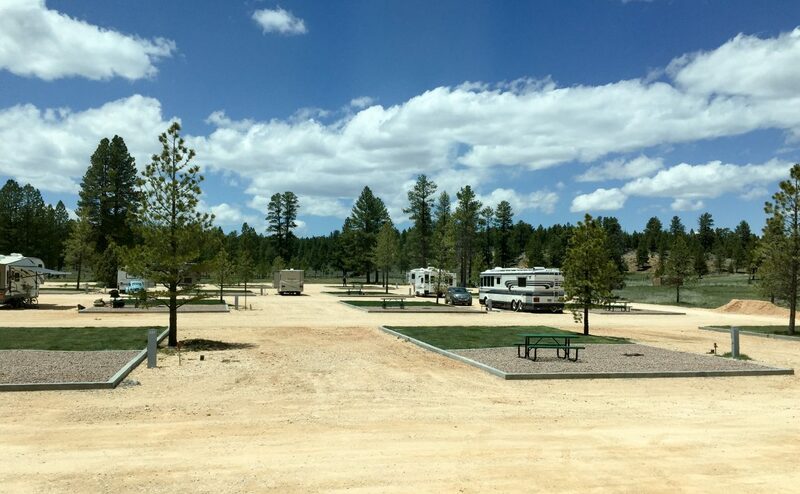 The huge sites in the new section of Ruby’s Inn RV Campground. Back at Lake Powell we randomly ran into RV bloggers Raven and Chickadee (Laurel and Eric) and had a great time getting to know them over drinks and snacks. We chatted about some of the other RV bloggers we’ve met and hoped to meet, and Laurel and Eric mentioned they had recently met up with Mona Liza and Steve of Lowe’s Travels. Imagine our surprise the next week at Bryce when we ran into Mona Liza and Steve while out walking Opie! It’s always great to find new RV friends since we’re always on the move and I can’t wait to cross paths again with those we’ve met in person. While the Grand Canyon was fairly dog-friendly, Bryce is definitely not. There are only two very short “sidewalk” style trails that allow dogs: the half-mile paved trail between Sunrise and Sunset Point, and the newly paved trail next to the main road. That meant we had to look further afield to deplete some of Opie’s boundless energy so we could do some dog-free hikes inside the canyon. Hiking with Opie at Red Canyon in Dixie National Forest. 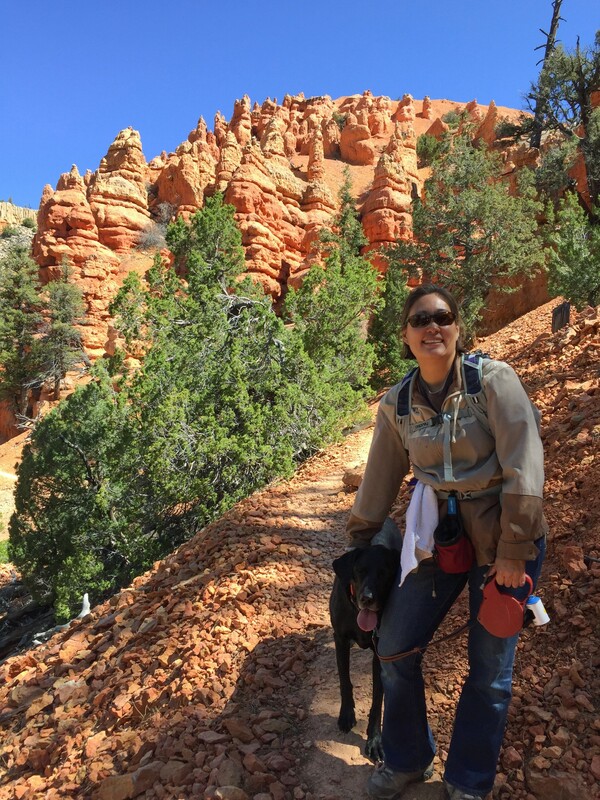 Red Canyon is located within Dixie National Forest and only about 20 minutes away from Bryce, and allows dogs on all their trails. The canyon is only a few miles long but has some very nice cliffs, hoodoos, and pine trees throughout the area. After stopping by the visitor center and chatting with a ranger there, we decided to do an easy two-mile hike made up of the Pink Ledges Trail (pick up the interpretive guide in the visitor center), Hoodoo Trail, Birdseye Trail, and the paved bicycle trail for the way back to the parking lot. The trails provided a lot of great variety plus the Pink Ledges interpretative guide gives great information about the local flora and fauna. Some of the Hoodoos in Red Canyon. While many drive right through Red Canyon on their way to Bryce, it seems that relatively few people actually stop to enjoy the scenery so we had the trail pretty much to ourselves. If you have the time, I highly suggest stopping at Red Canyon; however visit it first, before heading to Bryce. Bryce has such magnificent views that Red Canyon would pale in comparison. Hiking the Willis Creek Slot Canyon in Grand Staircase-Escalante National Monument. 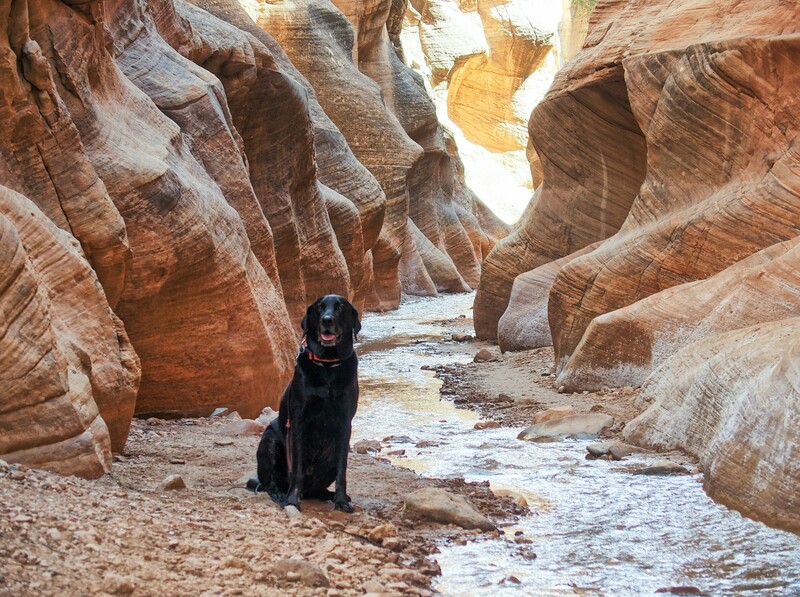 Another nearby great dog-friendly area is Grand Staircase-Escalante National Monument (GSENM). Grand Staircase encompasses over 1.8 million acres, with many different entry points and things to do. 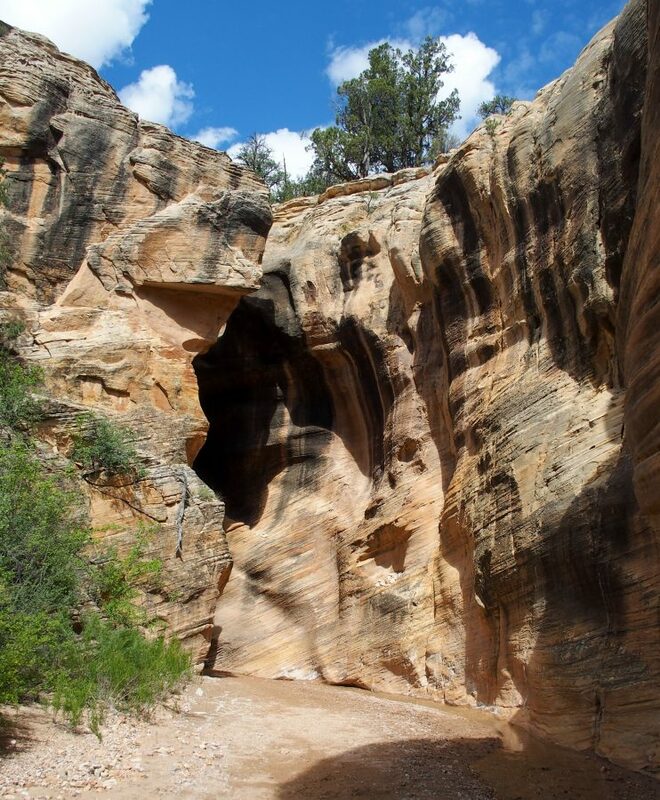 We did some research and decided to try one trail nearby (45 minutes away from Bryce), the Willis Creek Trail which is an easy canyon hike traveling through slot canyons and open areas. Due to the rain the day before, the stream running through the canyon was full of water, making for an extremely happy dog! 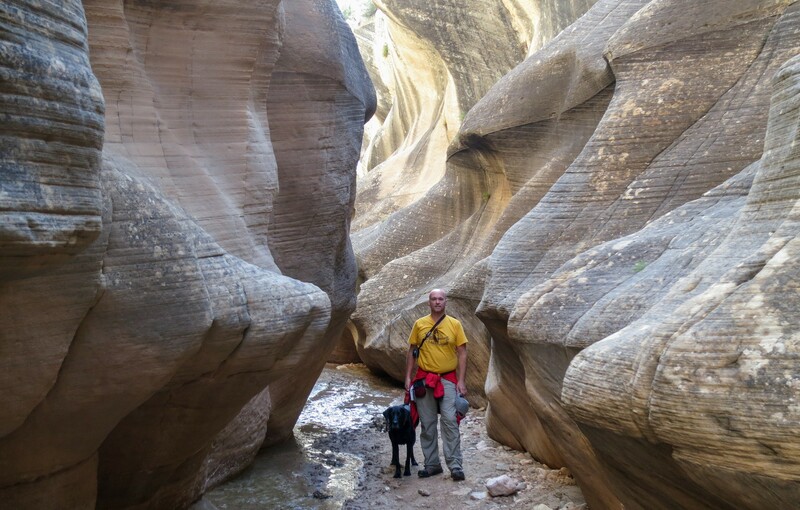 Opie loved the Willis Slot Canyon… an entire hike down a cool, wet creek. The trail is a flat, easy, out-and-back hike. In fact, I wouldn’t call it a hike as much as a nice easy stroll through some gorgeous slot canyons. The canyons occasionally open up into wide, flat areas surrounded by high canyon walls, and the further downstream you go, the taller the walls get. With the good water flow in the stream we did have to do some rock-hopping and shallow wading to cross over the stream many times as it wound its way down the canyon, so waterproof shoes came in handy. We walked a little over two miles into the canyon then turned around and came back. We really enjoyed this hike, finding it to be very different from our usual hikes. It also helped that we got an early start and encountered almost no other people until we were most of the way back to the beginning. Isn’t this where the adventurers usually meet their doom in fantasy movies? While the trail was easy, the unpaved road leading to the trailhead was anything but! The road is long, unpaved, bumpy, steep, and has river crossings and pools of standing water in a few spots. Make sure you have a car with decently high clearance that can handle some bumps and bruises if you want to get to this trail. Our Honda CR-V had no problems but we did pass a car’s front bumper sitting at the side of the road at one point from a less fortunate adventurer. 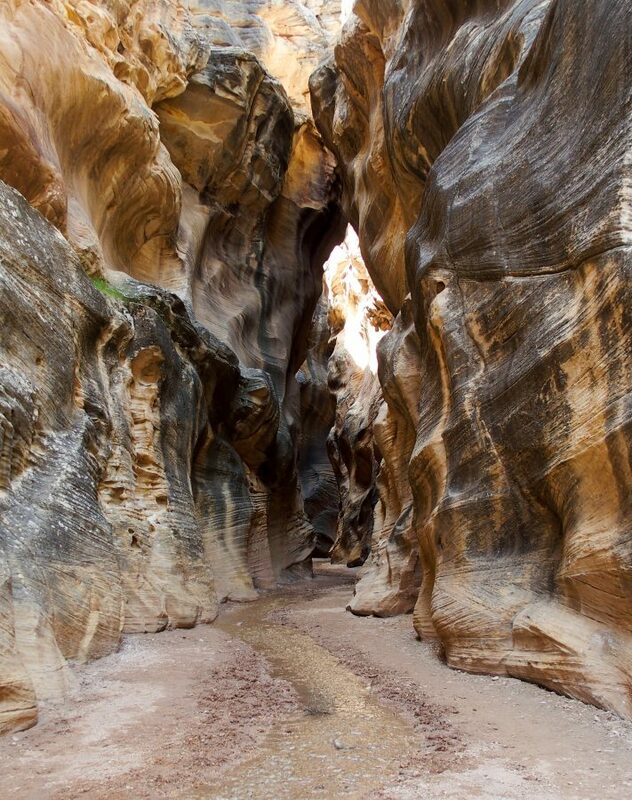 The Willis Creek slot canyon trail widens and narrows again several times. In we go! With our Opie-guilt assuaged, we were able to enjoy our time at Bryce. Bryce offers a free 3.5 hour guided tour to Rainbow Point twice per day (you need to reserve a day or two ahead), which includes pick-ups at Ruby’s RV Campground. We thoroughly enjoyed the tour, which stopped at Farview Point, Natural Bridge, Agua Canyon, Rainbow Point, and Fairyland Point. Our guide spent a lot of time explaining the geology of Bryce and many of the fauna in the area. Looking across part of Bryce Canyon during our free guided tour. 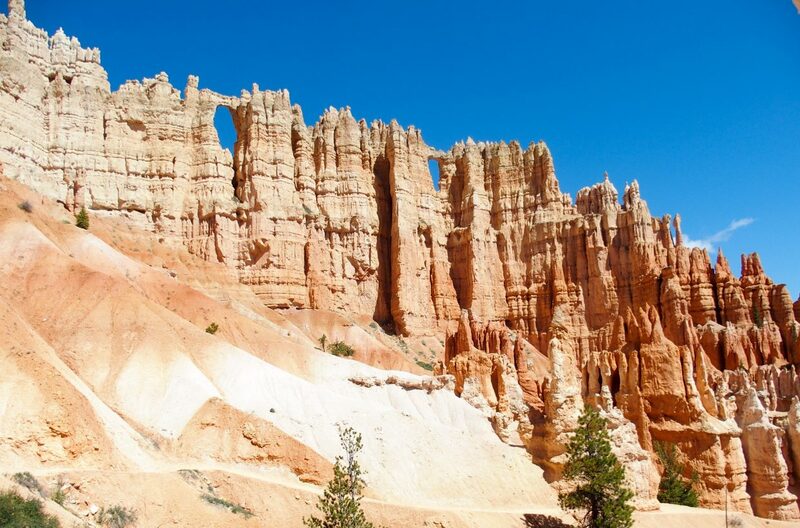 Bryce is well known for its spectacular hoodoos located throughout the park. 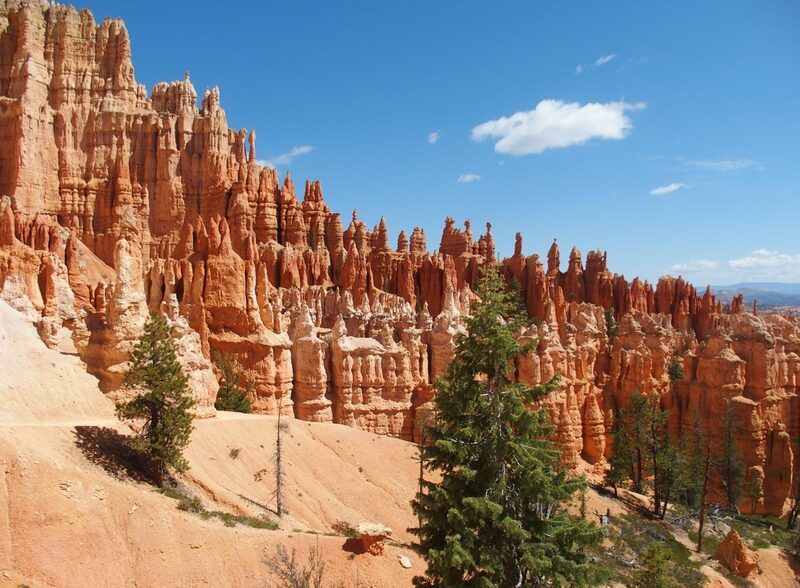 Hoodoos are long tall rock spires often consisting of soft and hard rocks. Erosion and frost wedging will erode the softer rock first, leaving behind the hard rock causing delicate and odd-looking formations. 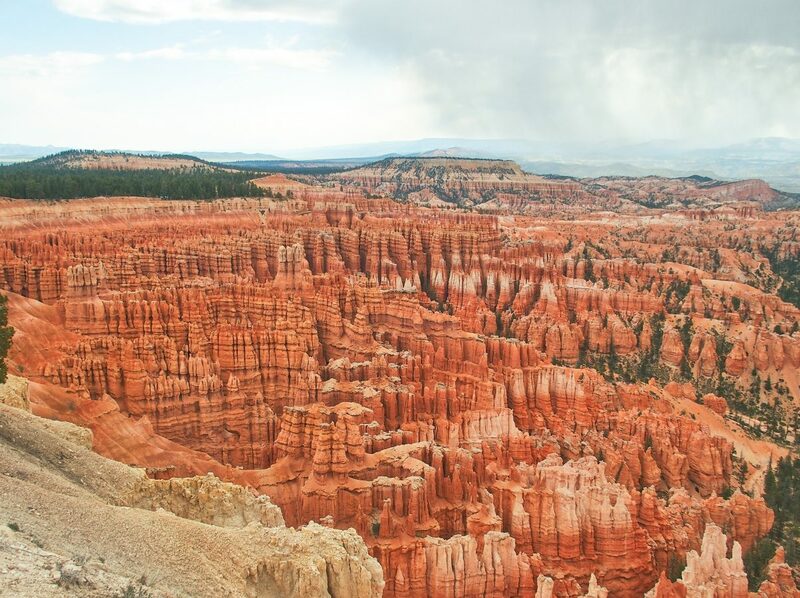 The hoodoos in Bryce are caused mainly by frost wedging since Bryce experiences over 200 nights per year of freezing temperatures and thawing/warm days. During the day, water will seep into the various rocks and freeze overnight. The frozen water expands, causing larger cracks/breaks in the rocks. 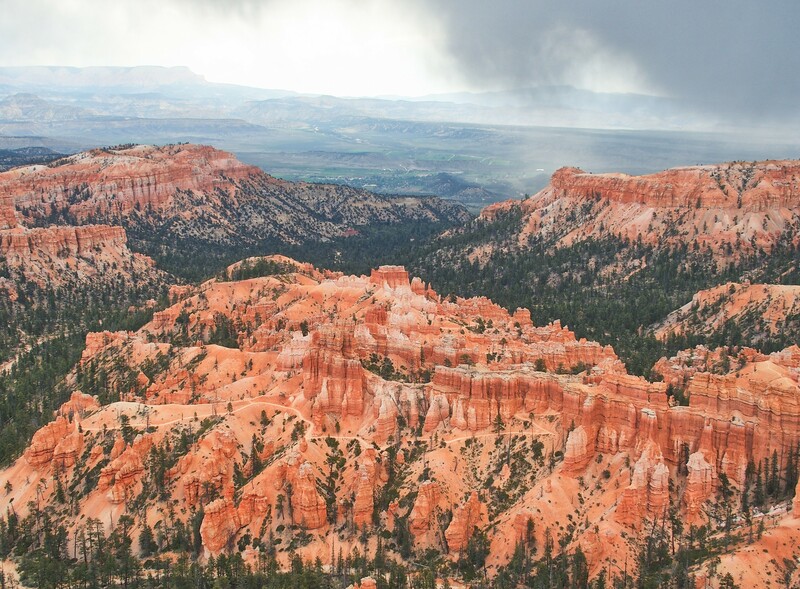 Plus, the rain at Bryce is slightly acidic which slowly eats away at the exposed limestone and smooths the edges of the hoodoos. Starting our hike down Queen’s Garden trail. We did a wonderful but strenuous hike into the canyon. We started down on Queen’s Garden, then walked Peekaboo loop, and climbed out through Navajo Loop and Wall Street. The walk through the canyon really shows off the various formations like windows, fins, pockets, and hoodoos. We started our hike in the early morning but due to the popularity of the trails, the crowds starting arriving in droves by the time we finished Peekaboo. The hike is around 6.5 miles with 2800 feet in elevation gain (mostly from Peekaboo) and took us around 3.5 hours to complete. We enjoyed the shade and scents from the pine trees in the lower canyon. Queen’s Garden is an easy gradual climb down into the canyon with some great views of hoodoos. Abundant trees and manzanita cover the bottom of the canyon, making for a nice change from the desert terrain above. At the bottom of the trail, we took the spur to Peekaboo Loop. 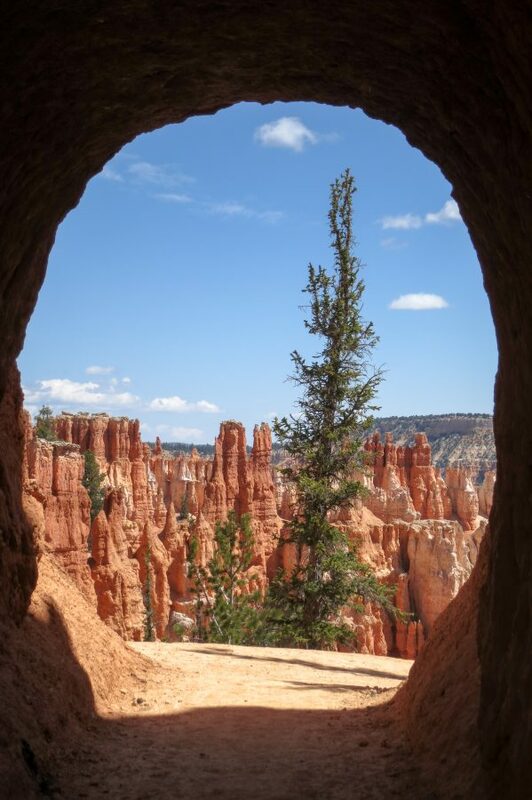 Peekaboo is a 3-mile loop through the heart of Bryce amphitheater. Due to the multiple elevation changes, Peekaboo is listed as a strenuous hike and we’d have to agree. There are a lot of ups and downs on this part of the hike but totally worth the effort. With breathtaking scenery around every corner, I understand why the trail is aptly named Peekaboo. Exiting a tunnel through the mountain on our hike. We made our way out of the canyon via Navajo Loop, walking through Wall Street, a narrow canyon with sheer walls on either side. The last part of the hike is just a large number of switchbacks to the top. With the crowds, it almost felt like an ant colony with so many of us moving up and down the trail. Looking back down the Wall Street switchbacks after making it partway up. 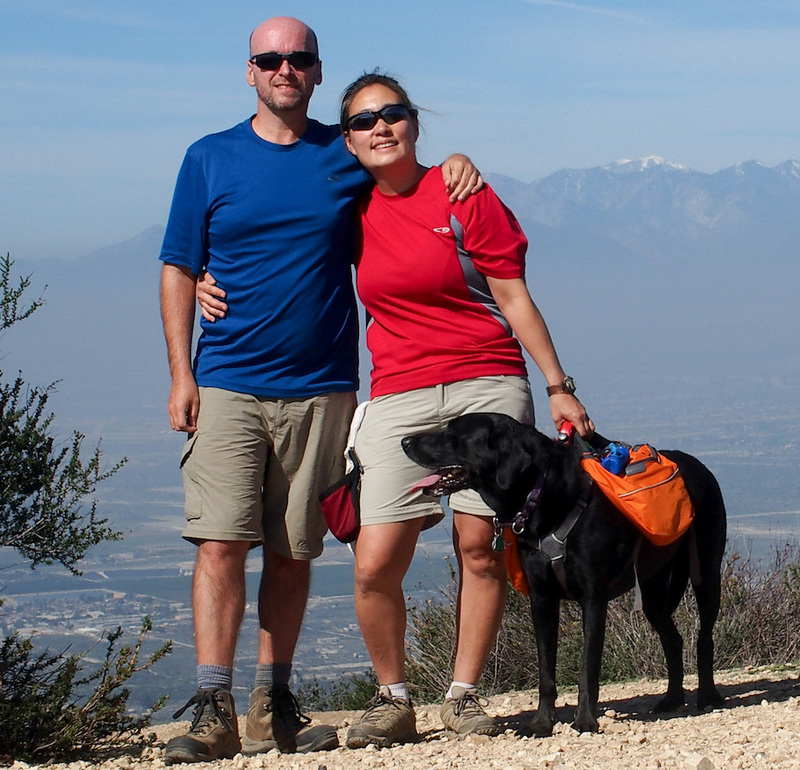 We truly loved this hike, the views are outstanding and the trails are well-marked. We found that we enjoyed this hike much more than our Grand Canyon hikes. 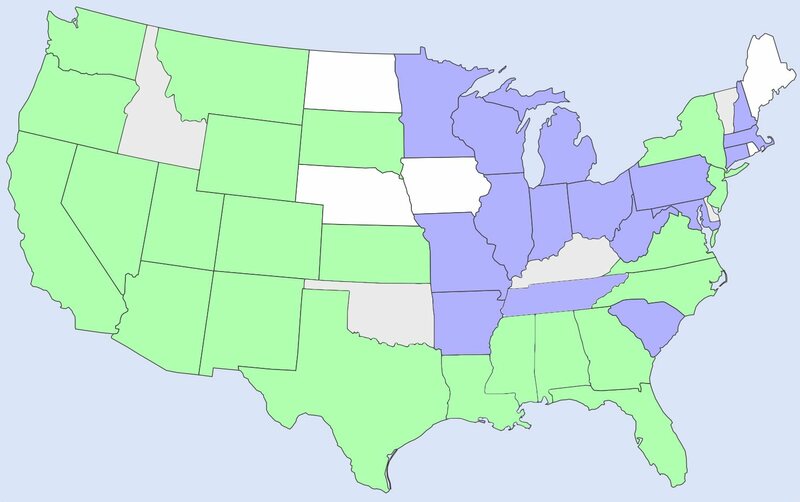 I think it’s due to the variation of scenery at Bryce vs. Grand Canyon, and the fact that there are plenty of breaks from the uphill climbs. Since the Grand Canyon is so, well, grand, what you see on trail is the same thing you see from the top of the Canyon. 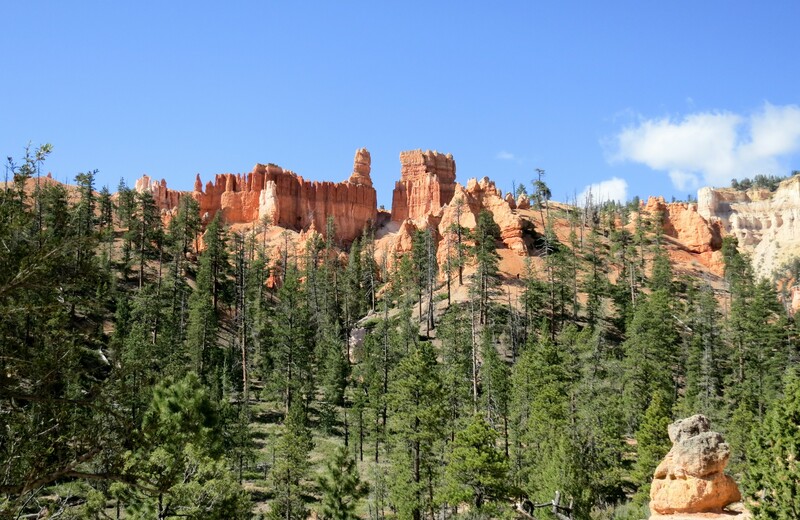 At Bryce, you’ll see so many different variations and structures which you may not see from the rim. Looking down at the Peekaboo Trail from Inspiration Point. As our last activity before departing the area, we drove to Inspiration Point, a spectacular viewpoint that allows you to see for miles over Bryce. As many have recommended, save Inspiration Point as your last overlook! 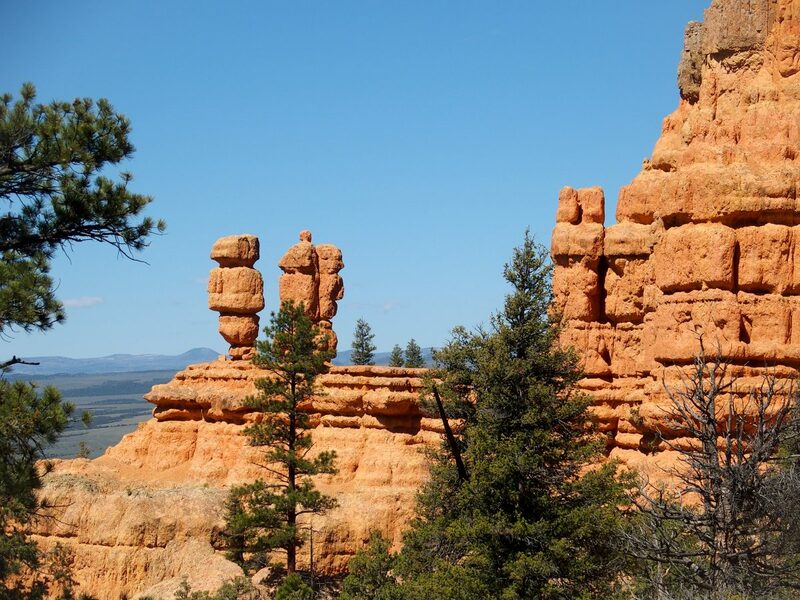 Hoodoo views go on for miles at Inspiration Point. 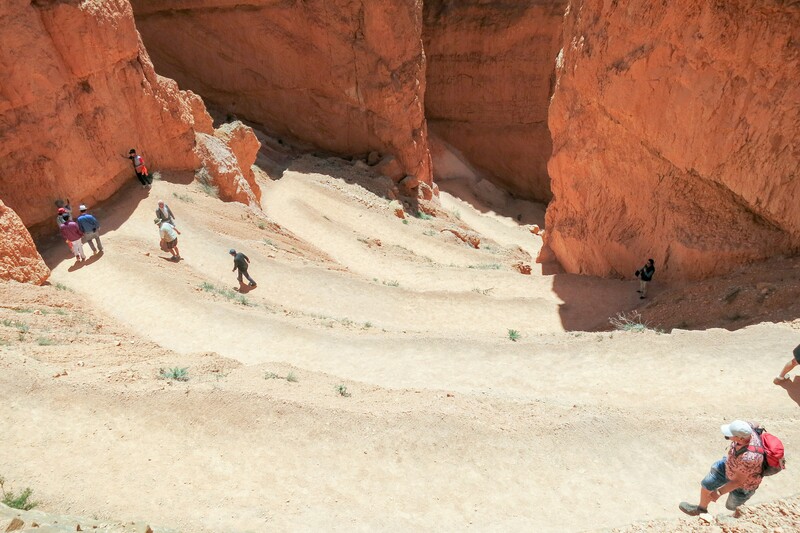 Queen’s Garden/Peekaboo/Navajo Loop is our favorite trail in Bryce, too. And I agree, Red Canyon is beautiful—and fortunately, not over visited (yet). Very cool slot canyon you discovered in the monument! Opie is a good tour guide, even if he doesn’t know it. :-) That’s so great that you met up with Mona Liza and Steve. We were supposed to meet up with them in Bryce, but the weather didn’t cooperate. Opie is definitely a good tour guide but sometimes I wish he was more of a couch potato! Course we do find some nice spots to visit because of him, so I guess it works out. It was good timing on meeting Mona Liza and Steve, I think we had a 1.5 day overlap before they left Bryce so it was a quick meet-up but enjoyable. Hoping our timing works out so we can meet up with you and Eric again, hopefully next year! Oh Im so glad you made it to Willis Creek, I wanted to do that hike but ended at Bull Valley Gorge instead. Opie is our identifier, and glad to meet both of you. Hope to cross paths again somewhere and catch up. Willis Creek was very enjoyable and pretty, especially for Opie! How did you like Bull Valley Gorge? There seems to be some drop-off points, making it a bit of a challenge. I think we might want to spend more time exploring Grand Staircase next time we’re in the area. 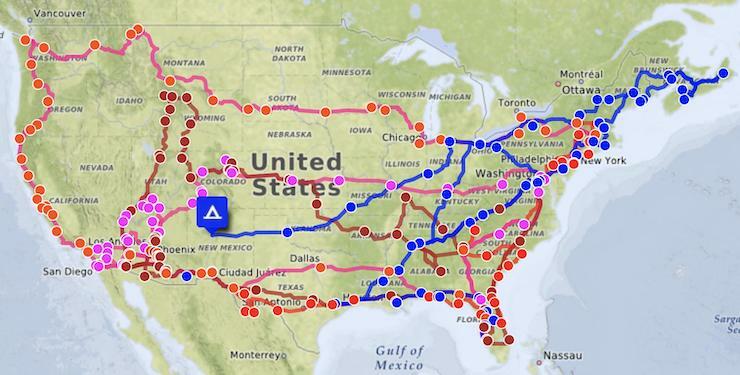 There appears to be lots of great trails to try. You are right, Opie is a good identifier. I think a few people have recognized us because of him, he’s famous! :) It was great to meet you two also and hope we can spend more time together next time.